"Today, as I have returned the completion of the final perfection of the Father, I am aware that I have offered my whole life up to this moment to the Father. 3. how much have you loved the nature. The intensity of our light in the spirit world will greatly depend on how much we lived our life on earth in loving God, humanity and natures. Those who have lived such a sincere life will have a bright spiritselves. this is one eternal truth that cant be denied. When such person enters the Spirit World, Father will welcome him/her even before he/she will look for Father. It doesnt matter if a person lived in the countryside with out any position. If he lived his life sincerely offering himself to God while on earth, his spirit will shine brightly. the most important thing is the intensity of light of our spirit selves that we are able to prepare before going to the spirit world. to Open True Father's 1st Anniversary Seonghwa. Father told us that when he visited hell in the Spirit World, he found many prominent scholars known throughout the world in the darkest place and TF asked them why they were there. Their answer was: "we have committed the sin of leading people away from God by writing books with our self-centered thoughts and through these books people were led day by day away from God and from the truth about God." From this important discovery, Father established the Professors world Peace Academy in 1973 (the first outreach organization created by Father) in order to guide world scholars to understand the Pricniple and the path to the heavenly kingdom. Most people even now do not think about the spirit world. They live because they were born, they serve their parents because they are there, and they live in their family because they were born into it. They live thinking that the reason they live this way is that they were born this way. What is the center of such a lifestyle? It is about how people should eat and how they should live their lives. That is why people consider food, shelter, and clothing to be the most important elements of life. The issues of living, feeding and clothing are central to most people. Of course, there are contents of morality and morals within human relationships that enable people to improve, develop and to find satisfaction together. However, the standard of that morality varies, as do races and nations. Moral standards and social systems all vary in accordance with the world's diverse cultural backgrounds. 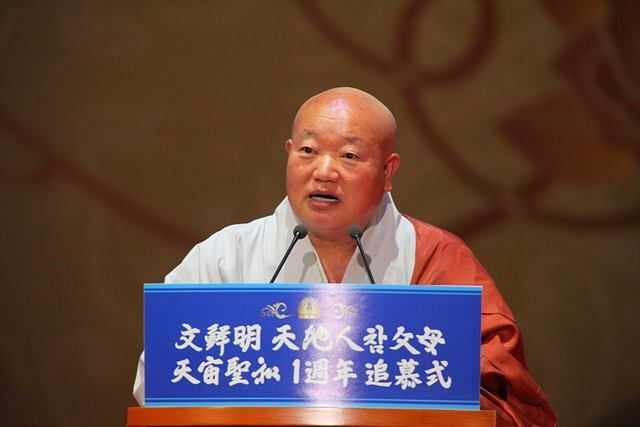 From this point of view, the original standard which people should follow throughout history and the existing moral and ethical standards that we adopt in our lives are scattered in all directions. they have not been systematized into an integrated whole. Based upon being born and living in the original world, where should we be headed? People are not clear about this. Because of this, ordinary people do not know whether the spirit world and God exist. However, our Unification Church members clearly know that the spirit world exists. they do not just believe it -- they know it. Why? They know it through countless spiritual experiences. 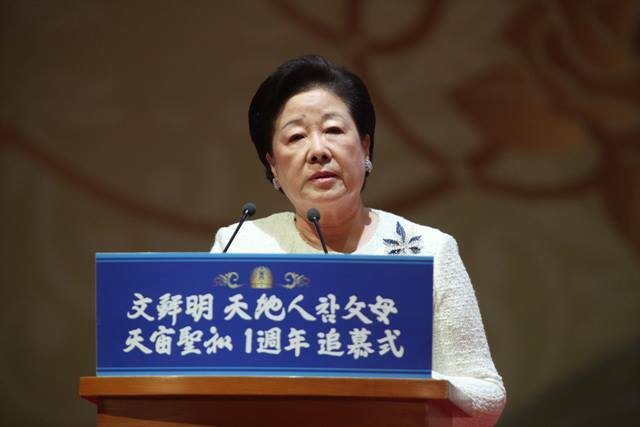 Viewed against the backdrop of the global foundation the Unification Church has established today, we have evidently undergone a process of many spiritual experiences. 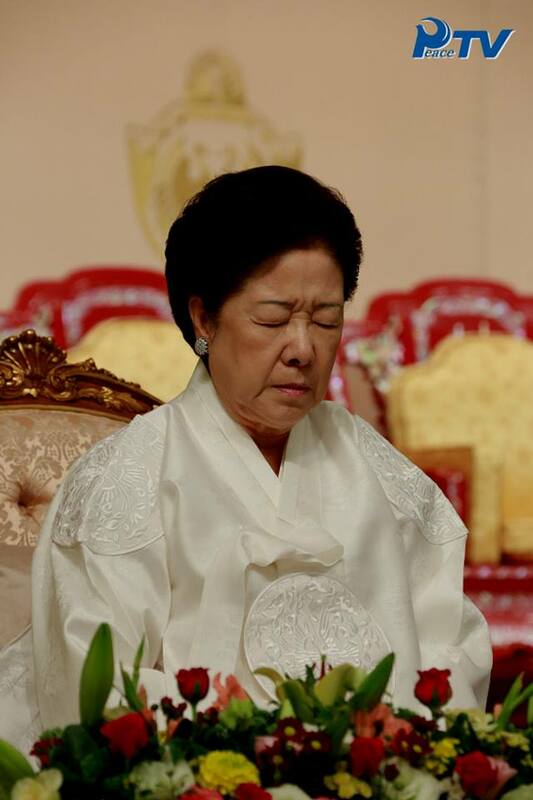 Therefore, Unification Church members are in no position to deny the existence of the spirit world. the True Parent of Heaven, Earth and Humankind"
The Memorial ceremony for the one-year anniversary of Rev. 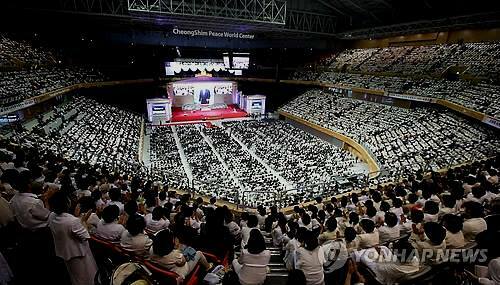 Sun Myung Moon, founder of the Family Federation for World Peace and Unification (FFWPU) was held at the Cheongshim Peace World Center in Gapyeong, Korea on August 23, 2013 at 10 a.m. Upwards of 25,000 people were expected to attend. 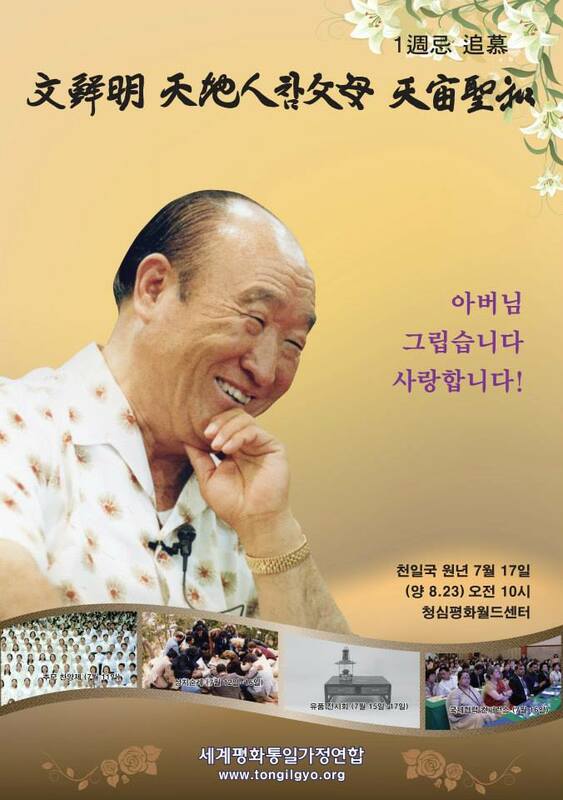 The official title for the ceremony is “The First Anniversary of the Universal Seonghwa of Sun Myung Moon, the True Parent of Heaven, Earth and Humankind.” A full week of memorial events in Gapyeong starts on August 17th and will end on Saturday, August 23rd. Rev. Sun Myung Moon was born in Jeong-ju Township, Pyong-an Province in North Korea on January 6, 1920 and spent his last day on earth at the Cheongshim International Hospital where he passed away on September 3, 2012 1:54 a.m. During last year’s 13-day mourning period, approximately 250,000 people from around the world visited Korea to pay their respects. FFWPU celebrates their significant days by the lunar calendar, so they will commemorate Rev. Moon’s Seonghwa memorial annually on July 17th of the lunar calendar. FFWPU refers to funerals as Seonghwa ceremonies. Rev. Moon taught that death is not the end of life, but instead marks entry to a new world of spirit. 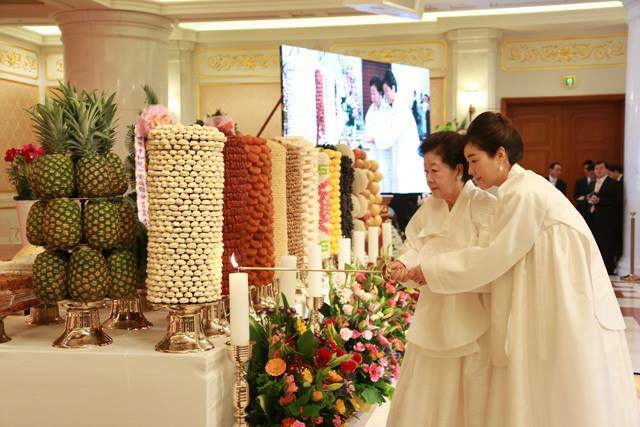 FFWPU’s funerals actually celebrate an individual’s entrance to his or her new life; therefore, the Seonghwa ceremony decorates with white ribbon and/or colorful flowers instead of black ribbon and/or unicolor condolence flowers. Rev. Moon was a peace-loving world citizen. In his autobiography, he reflected on his life this way: “Since I was called by God at Mount Myodu, I have lived life like a marathon athlete who only runs for God’s will. It wasn’t a life that could compromise. It was a life of blood, sweat and tears.” In the Bible Jesus said, “a prophet hath no honour in his own country.” At the one-year anniversary of Rev. Moon’s Seonghwa, many will gather in Rev. 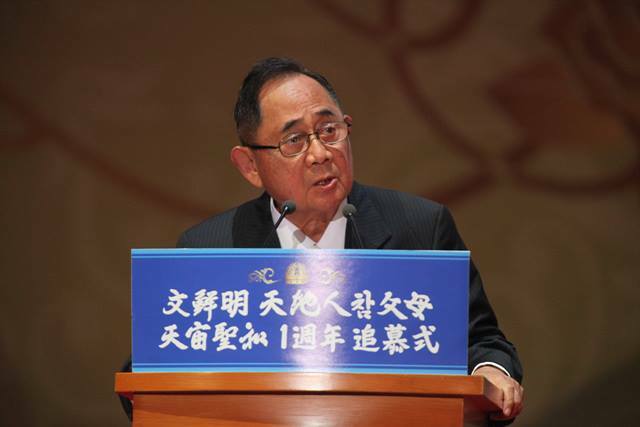 Moon’s homeland to evaluate his extraordinary life properly. 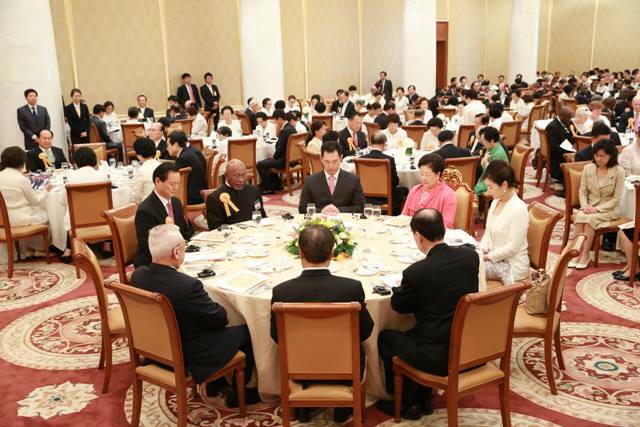 The ceremony was broadcast live to 194 nations. 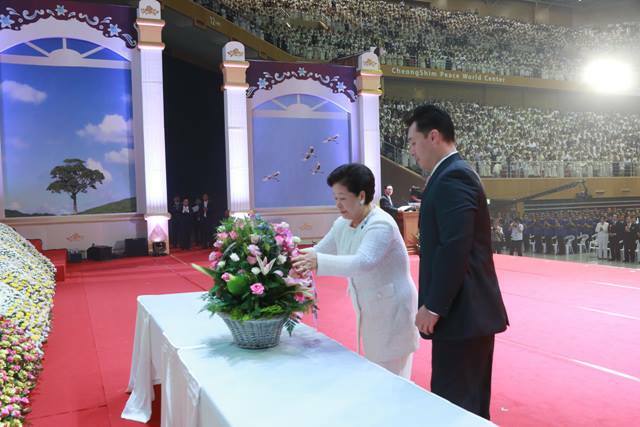 At the Cheongshim Peace World Center, 25,000 people, including VIP’s and visitors from around the world reviewed Rev. Moon’s life achievements and his determination to make a peaceful world. There were a memorial ceremony, memorial performances and a number of memorial events. 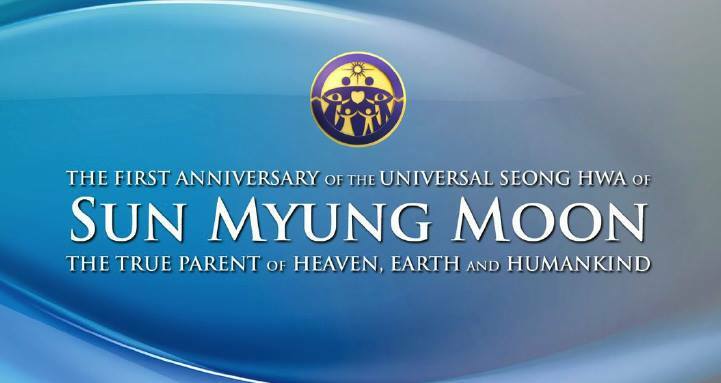 "The First Anniversary of the Universal Seonghwa of Sun Myung Moon, the True Parent of Heaven, Earth and Humankind – August 23, 2013, Gapyeong, Korea." About 25,000 attendants, including VIPS, who love and miss Rev. Dr. Sun Myung Moon have returned to attend his Memorial Ceremony in Gapyeong, Korea for the one-year anniversary of his Seonghwa (Ascension) Ceremony on August 23, 2013 (or July 17, 2013 according to the lunar calendar). People have gathered from 60 nations, including 7,000 people from Japan. Also, members of the Family Federation for World Peace and Unification (FFWPU) have come from around the world. Members who could not physically attend the event in Korea participated via live Internet broadcast, which was sent out to 193 nations. FFWPU celebrates their significant days by the lunar calendar; so FFWPU will commemorate Rev. Moon’s Seonghwa memorial annually on July 17th by the lunar calendar. Dr. Chul Seung Lee, Chairman, Seoul Peace Prize Cultural Foundation; The Venerable Seong Ta, Head Monk of Bulguk Temple; Minister Sung Choon Park of Patriots and Veterans Affairs; Hon. Bong Ho Kim, Former Vice Chairman, Korean National Assembly. Hon. Domitien Ndayizeye, former President of Burundi; Mrs. Aude Ndayizeye, former First Lady of Burundi; Hon. Malimba Masheke, former Prime Minister of Zambia; Hon. Jose de Venecia, former Chairman of the National Assembly of the Philippines. 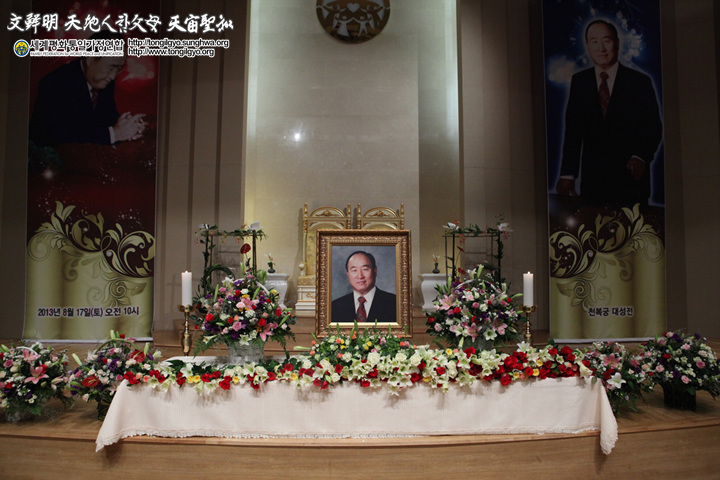 The First Anniversary of the Universal Seonghwa of Sun Myung Moon, the True Parent of Heaven, Earth and Humankind was held in a solemn atmosphere. 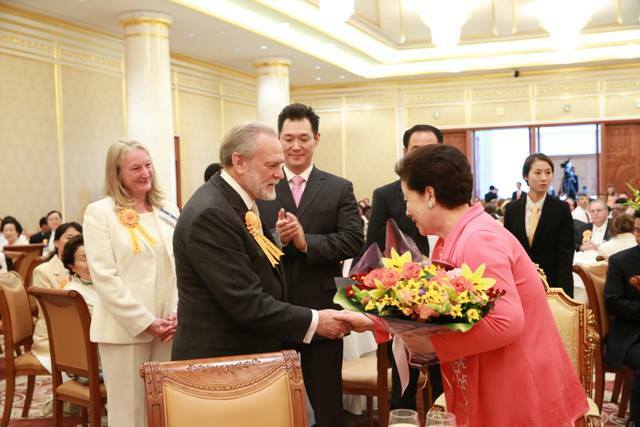 The ceremony started with the entrance of Dr. Hak Ja Han Moon who offered flowers to Rev. 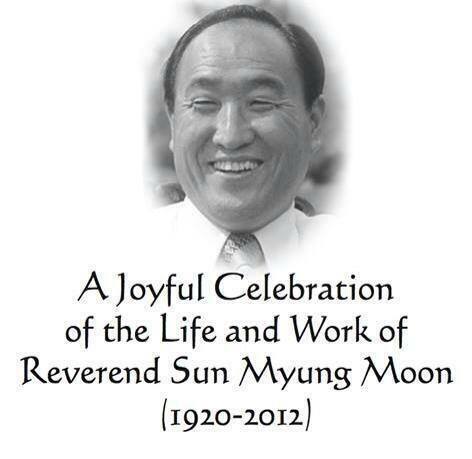 Sun Myung Moon’s photo. Dr. Chang Shik Yang, Vice Chairman of FFWPU-International, served as the emcee and gave the opening remarks. The Opening Prayer was given by Archbishop George Augustus Stallings, Jr. Offerings of flowers were made by family members and representatives. A video presentation of Rev. Moon’s life and achievements was shown. 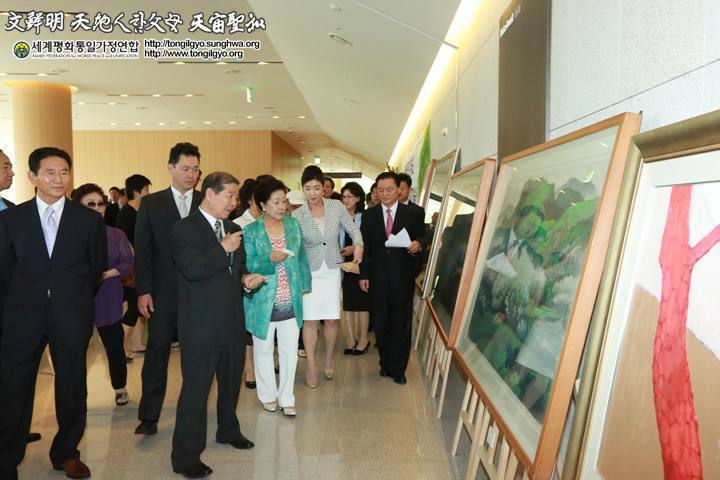 Memorial Addresses were given by Dr. Chul Seung Lee, The Venerable Seong Ta, Hon. Jose de Venecia, Then the Memorial Poems, “The Crown of Glory,” was presented by video as well as a reading of “Letter to My Father” by actress Hye Seon Jeong. Then White Paper was presented. A commemorative video for Rev. 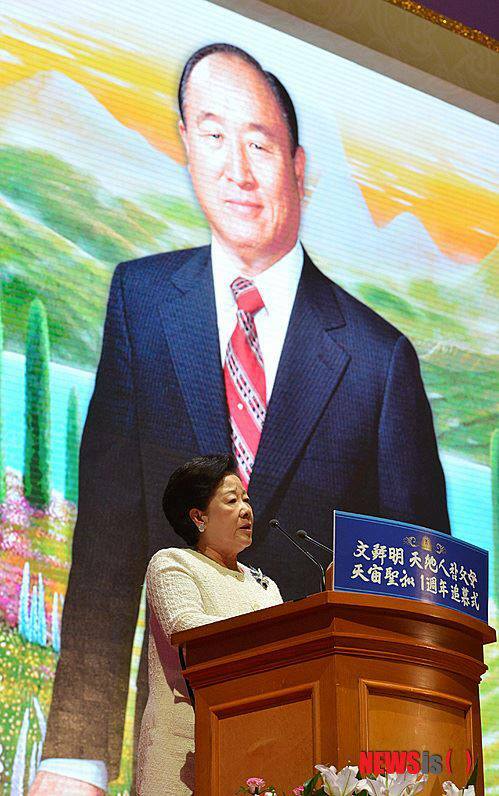 Sun Myung Moon was shown, and then Dr. Hak Ja Han Moon gave a speech. Throughout this event, participants reflected on the dedication and achievements of Rev. Moon as well as his determination to build world peace. Part two of the event included commemorative performances. The order was a video of Rev. Sun Myung Moon’s favorite songs, a song performance by his grandchildren, a performance by singer Gloria del Paraguay, a performance by the Japanese Sun-hak Choir, Musical Gala Show ‘Crown of Glory’ and a group choir by all the performers. The FFWPU made an exhibition of Rev. Moon’s 120 pieces of personal keepsakes that included daily supplies; clothes, pictures, etc., which were made open for viewing to the public for the first time. Also, the FFWPU released the condolence message from the North Korean Supreme Leader Kim Jong-un. When Rev. Moon was alive, he maintained a very close relationship with North Korea through business and exchanges for the peaceful reunification of South and North Korea. Accordingly, North Korea always sent birthday presents to Rev. Moon and Dr. Han. This year (2013) North Korea sent a pair of rare Poongsan Dogs. This was the first publicized gift from North Korea. The male dog was named Jeong-ju, after Rev. Moon’s hometown and the female dog was named An-ju, after Dr. Han’s hometown. During this memorial period, numerous events contemplating the achievements of Rev. Moon and his life were arranged over seven days from August 17th to the 23rd. These events reminded members to inherit Rev. Moon’s peace ideology and vision 2020, which is to build a foundation for world peace. Rev. 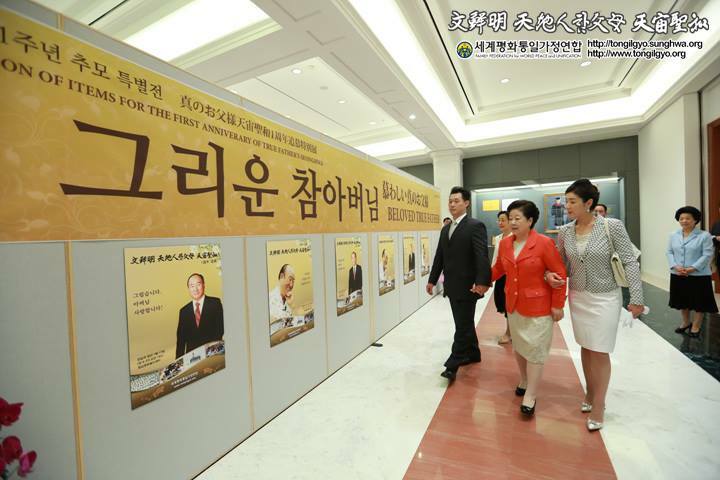 Sun Myung Moon’s Keepsake Exhibition, Commemorative Photo Exhibition, Awards for the Commemorative Memoir Contest by UPF, International Leadership Conference (ILC), Rally for Unification, World Peace and Unification Art Festival, etc., were prepared for this memorial period. The absolute, unique, unchanging and eternal one in whom we live, move, and have our being. We thank you that in the fullness of time, You sent upon the earth, The True Parents of Heaven, Earth and Humankind, in the persons of the Rev. Dr. Sun Myung Moon and his beloved wife Dr. Hak Ja Han Moon to restore all things and to proclaim the Kingdom of God on Earth. You annointed, appointed and approved True Parents for this Providential moment in salvation history .. And endowed them with power and authority to complete all things. We have gathered in this holy place to celebrate and commemorate the first anniversary of the victorious and glorious universal Seung Hwa Ascension of True Father. We commemorate his physical death, while readily admitting that we still suffer from the pangs of no longer being able to see Him Face to face... or feel the warmth of his magnetic touch. Although each one of us has been diminished by his transition, our faith reassures us that even though His body has returned to earth, from whence it came, his spirit has returned unto You, oh Heavenly Parent, who gave it. Oh God, You and True Father are now One. And where ever You are, so is he. What more could we ask of you oh giver of eternal life? We thank You oh Heavenly Parent, that in True Father's physical passing you do not leave us widowed or orphaned but prepared, annointed and divinely appointed True Mother to lead and follow his life course of living for the sake of others. Loving one's enemy and working tirelessly to establish a world of true and lasting peace as a prelude to bringing about the manifestation of the Kingdom of God on Earth. True Father proclaimed before his transition, while holding True Mother's hands in prayer, "according to His Will, I am spending this time to bring my life to a conclusion, using this time to bring it to a close with sincerest heart and devotion .. I have accomplished everything that Heaven required." True Father shared with us that when God called him home to Heaven, True Mother will lead us to fully realize Cheon Il Guk. Through it all, they established your Blessing and brought about the restoration of true love, true life and true lineage. This is Your day of Blessing, God, where You are now Substantial both in Heaven and on Earth through True Parents. Together with, and through the True Family and all those blessed by True Parents today Your Safe Settlement among all humanity, is sealed forever ... And Your liberation is complete. May God Bless this Glorious Moment in the course of human history. One year has passed since your ascension. The intensity of your life began even before your birth. The cries for Korea's independence on the 1st of March in 1919 marked the conception of your life, heralding a thorny path that would be filled with tribulations, adversity and hardship. True Father's life and youthful days were filled with extreme hardships Knowing that the Heavenly Parent was compelled to guide you on that path, We're blinded by the tears that well up from our heart. On the day you were released from Heungnam prison, you could have chosen to visit Chungmonim, who was nearby, yet, because of true love, you departed North Korea carrying your disciple on your back, who had broken his leg. On this lonely path you followed the will of God's providence, and whenever you went beyond the pass of Golgotha, you beat down and pushed back your tears. We cannot fathom the blood and tears that you shed in your heart. At the rally to save the nation held at Yoido, Your determined roar towards the millions gathered there was strong, And silently you wept after reading letters from missionaries Who were in prisons in communist nations, "Father, may your precious body be preserved. I will see you again in the other world." "America must awake!" so you cried, in the land of freedom, At the Kremlin, you prayed for the end of Communism And while even embracing Kim Il Sung, You wielded an iron rod towards the nations, Yet to us you were always a passionate and affectionate Father. Last year, as Autumn was falling upon us The sad news that you had ascended left all of us dumbfounded. Before ascending to the Heavenly Nation, you gazed at True Mother's face, as if to engrave her image in your heart. And you sat across from True Mother at a table for two. Your last outing was your visit to Osan school, a mirror of your hometown. You went around Cheon Jeong Gung sustained by an oxygen tank saying your last farewell. When I think about your prayer, when you proclaimed, "It is all accomplished!" Tears well up in my eyes and my heart aches thinking about it. Father, no matter how many times I call you, I still want to call you again. Father, I miss you dearly. You are the light of my life, you were like an ever expanding ocean to me. Father, when you suddenly ascended to the Heavenly Nation, We assumed that True Mother would be the most grieved, and yet, She was the first to raise the torch of true love. 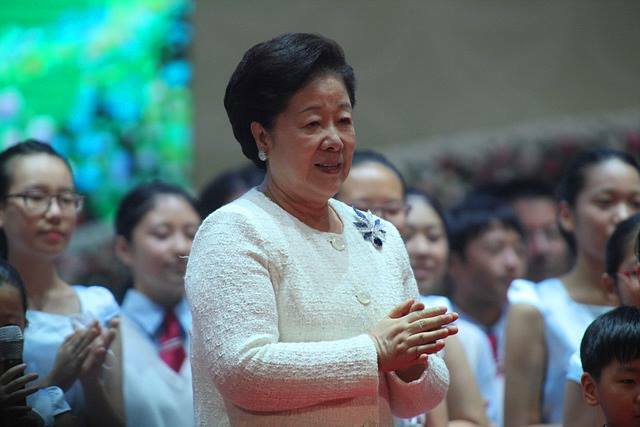 With Foundation Day approaching, she raised her voice and commanded, "There is no stopping!" "We shall advance. Invest yourself completely with a life or death resolution. You must do your best with all your heart." She raised high the torch of love. Father, you spent each day like a thousand years as you waited for Foundation Day. Yet one day you let go of our hands and ascended to the Heavenly Nation and opened the gates to the kingdom of heaven. True Mother is now taking the lead and guiding us on the path to heaven, Which you had shown to us. We, too, shall follow True Parents in this way. We shall live a life so that when we conclude our life on earth and rise to heaven, we too can proudly say, "We have accomplished everything." We know that you will always be there for us in the Heavenly Nation, And we shall attend True Mother on earth and We will do our best to fulfill Vision 2020. 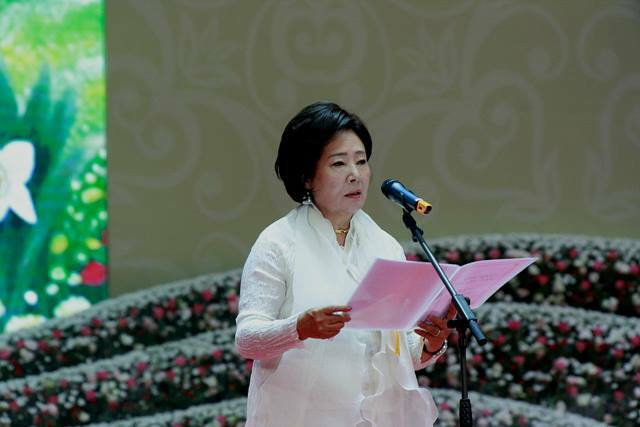 Presented on the 17th day of the 7th month by the Heavenly Calendar in the 1st year of Cheon Il Guk by Hye-seon Jeong, representing members from around the world. Thank you, please be seated everyone. 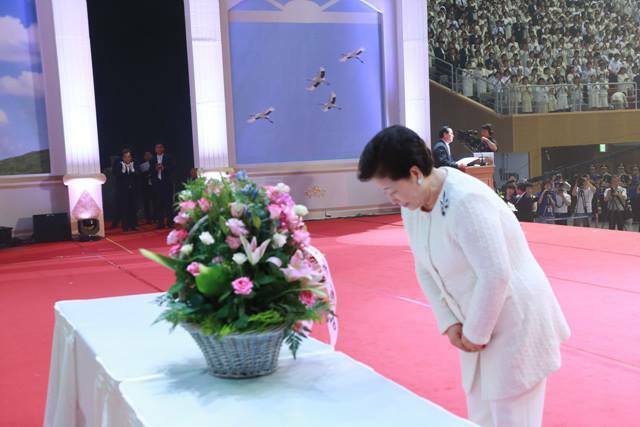 Respected guests from Korea and abroad, those who have spoken precious words at this memorial service that can bring us together touching our hearts, and Unification Church Members from around the world, today we have become as one. It feels like Father would stride forward with a bright smile and ask "How`ve you been?" Beloved Peace Ambassadors, we have united in heart and in will. While admiring the great works of True Father, at present you and I have determined to fulfill the will at all costs. Korea and Japan have become one centering upon this Seonghwa period. Last August 3rd I witnessed the the peace march that started from Hokkaido and worked its way down the Japanese archipelogo with great fervor and continued in Korea from Busan, a unification of Korea and Japan, with the bicycle parade riding all the way to Imjingak, putting into practice the long awaited reunification of the fatherland, North and South Korea. Now we will not end this condition merely at Imjingak but continue past Baekdusan Mountain, across Asia and move forward on and on until the joyful Kingdom of Heaven on Earth that God has long awaited, can be achieved. On this great day, I love our distinguished guests, blessed families and True Father from the bottom of my heart. You will become one with me and must absolutely become the children who Will see the Will of God and the Will of the True Parents of Heaven and Earth be done. You will become filial sons and daughters. I sincerely hope that at this moment, you can make a resolution to become loyal subjects.